(AP)—Determined to kill or capture a murderous Mekong River drug lord, China's security forces considered a tactic they'd never tried before: calling a drone strike on his remote hideaway deep in the hills of Myanmar. The attack didn't happen—the man was later captured and brought to China for trial—but the fact that authorities were considering such an option cast new light on China's unmanned aerial vehicle program, which has been quietly percolating for years and now appears to be moving into overdrive. Chinese aerospace firms have developed dozens of drones, known also as unmanned aerial vehicles, or UAVs. Many have appeared at air shows and military parades, including some that bear an uncanny resemblance to the Predator, Global Hawk and Reaper models used with deadly effect by the U.S. Air Force and CIA. Analysts say that although China still trails the U.S. and Israel, the industry leaders, its technology is maturing rapidly and on the cusp of widespread use for surveillance and combat strikes. "My sense is that China is moving into large-scale deployments of UAVs," said Ian Easton, co-author of a recent report on Chinese drones for the Project 2049 Institute security think tank. China's move into large-scale drone deployment displays its military's growing sophistication and could challenge U.S. military dominance in the Asia-Pacific. It also could elevate the threat to neighbors with territorial disputes with Beijing, including Vietnam, Japan, India and the Philippines. China says its drones are capable of carrying bombs and missiles as well as conducting reconnaissance, potentially turning them into offensive weapons in a border conflict. China's increased use of drones also adds to concerns about the lack of internationally recognized standards for drone attacks. The United States has widely employed drones as a means of eliminating terror suspects in Pakistan and the Arabian Peninsula. "China is following the precedent set by the U.S. The thinking is that, 'If the U.S. can do it, so can we. They're a big country with security interests and so are we'," said Siemon Wezeman, a senior fellow at the arms transfers program at the Stockholm International Peace Research Institute in Sweden, or SIPRI. "The justification for an attack would be that Beijing too has a responsibility for the safety of its citizens. There needs to be agreement on what the limits are," he said. Though China claims its military posture is entirely defensive, its navy and civilian maritime services have engaged in repeated standoffs with ships from other nations in the South China and East China seas. India, meanwhile, says Chinese troops have set up camp almost 20 kilometers (12 miles) into Indian-claimed territory. It isn't yet known exactly what China's latest drones are capable of, because, like most Chinese equipment, they remain untested in battle. The military and associated aerospace firms have offered little information, although in an interview last month with the official Xinhua News Agency, Yang Baikui, chief designer at plane maker COSIC, said Chinese drones were closing the gap but still needed to progress in half a dozen major areas, from airframe design to digital linkups. Executives at COSIC and drone makers ASN, Avic, and the 611 Institute declined to be interviewed by The Associated Press, citing their military links. The Defense Ministry's latest report on the status of the military released in mid-April made no mention of drones, and spokesman Yang Yujun made only the barest acknowledgement of their existence in response to a question. "Drones are a new high-tech form of weaponry employed and used by many militaries around the world," Yang said. 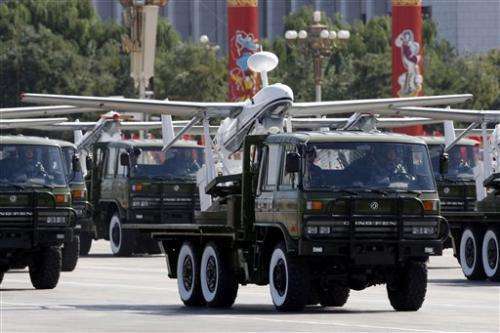 "China's armed forces are developing weaponry and equipment for the purpose of upholding territorial integrity, national security and world peace. It will pose no threat to any country." Drones are already patrolling China's borders, and a navy drone was deployed to the western province of Sichuan to provide aerial surveillance following last month's deadly earthquake there. They may also soon be appearing over China's maritime claims, including Japanese-controlled East China Sea islands that China considers its own. That could sharpen tensions in an area where Chinese and Japanese patrol boats already confront each other on a regular basis and Japan frequently scrambles fighters to tail Chinese manned aircraft. Retired Maj. Gen. Peng Guoqian told state media in January that drones were already being used to photograph and conduct surveillance over the islands, called Diaoyu by China and Senkaku by Japan. The Pentagon says Chinese drones could boost the effectiveness of long-range radar in monitoring activity and locating targets in the western Pacific far from the Chinese coast. Their missions could include guiding home an anti-ship ballistic missile known in military circles as a "carrier killer," the Pentagon said in its 2012 report on China's military. Reports about the search for notorious river bandit Naw Kham, wanted for the 2011 murders of 13 Chinese sailors, offer some clues about China's plans for drones. The head of the Chinese Public Security Ministry's anti-narcotics bureau, Liu Yuejin, was quoted by state media as saying a plan had been floated to target Naw Kham's fortified camp with a drone loaded with 20 kilograms of TNT. The type of drone wasn't mentioned. The plan was dropped by higher-ups in favor of taking Naw Kham alive, but the revelation served as a statement of Chinese intentions and capabilities. China began developing drones in the 1960s and is believed to have used them for reconnaissance during its brief 1979 invasion of Vietnam. The program was aided by the adaptation of foreign civilian or dual-use UAVs for military purposes, then took a leap forward with the purchase of Harpy drones from Israel. Later, U.S. opposition to Israeli upgrades on the Harpys spurred China to build its own version. China's gains are aided by the industry's relatively low costs and short production schedule and boosted by the assembly of the country's homebuilt Beidou navigation satellite system and improved high-speed data links. China's military is expected to field hundreds, if not thousands, of drones, although the overall size of the fleet is difficult to estimate and the U.S. will ultimately have many more. Chinese UAVs range from simple propeller-driven models to the high-concept, stealthy Dark Sword, featuring a joined wing and tail assembly similar to the U.S. Avenger. More than 90 percent of the Chinese drones now in service are variants on the simpler ASN-209 surveillance drone seen in navy drills and which are now being produced under license by Egypt. Others include the Wing Loong, or Pterodactyl, which bears a striking resemblance to the U.S. Reaper and carries a brace of missiles. 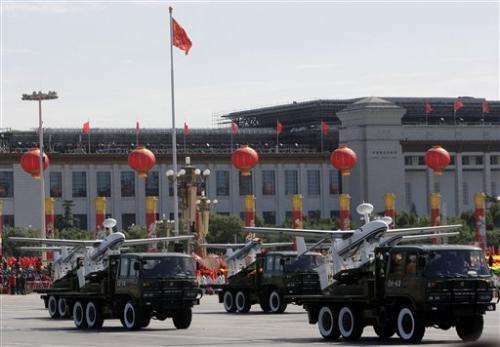 Chinese media reports and air show staff say it has been exported to countries in the Middle East and Central Asia, possibly the United Arab Emirates and Uzbekistan, at just a fraction of the Reaper's price tag of $30 million each. Military officials in the UAE and Uzbekistan declined to comment on the reports. Another combat drone being offered for export, the CH-4, has space for four missiles and is said to be able to fly continuously for 30 hours. Even more ambitious is the Xiang Long BZK-005, similar to the U.S. Global Hawk. It has a reported 6,437-kilometer (4,000-mile) range and is roughly the size of a medium-size fighter jet. Deployment may be some time off, however, and a 2011 crash points to rumored problems with the guidance system. Further developments could see China competing with world's two major drone producers, the United States and Israel, for markets in close ally Pakistan, Myanmar and other developing nations. Customers might even include Russia, which is the world's No. 2 arms exporter but has had little success making UAVs. There are some indications China may already be exporting know-how to Pakistan, given design similarities between Chinese drones and Pakistan's Shahpar UAV, said Huw Williams, an expert on drones at Jane's Defence Weekly. However, Williams said China will likely struggle to find customers for its larger drones, given limited demand and the large number of countries developing such systems of their own. "They're very interested in getting into this market," SIPRI's Wezeman said. "Another few years and they will have caught up."